In 1985, one of the greatest treasure discoveries was made off the Florida Keys, when the wreck of the Spanish ship Atocha was found. On board were some forty tons of silver and gold, which in 1622 had been heading from the New World to the Spanish treasury as the means to fund the Thirty Years’ War. 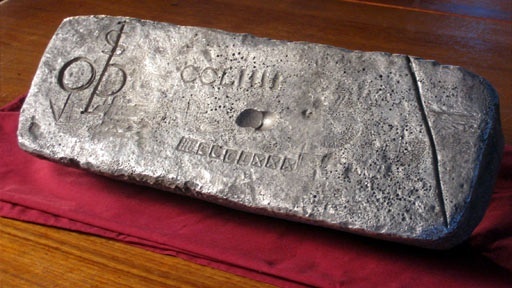 A man from Cedartown, GA was a diver on that legendary find, and received two silver bars as compensation for his efforts. He's long been mystified by a strange mark that appears on one of the bars, but the mark is mysteriously absent from the other bar. History Detectives translates 300-year-old documents from the archives of the Spanish treasury in Seville to crack a unique code of communication among ship captains of that era. Also in Season 6 Annie Oakley Coin Was this coin a target for one of the Wild West's most popular female sharpshooters? Also in Season 6 WWII Diary Does this diary hold the key to understanding the fate of a missing bomber pilot from World War II? Also in Season 5 Manhattan Project Letter Did this letter help persuade President Harry S. Truman to change policy in the post war era? Also with Tukufu Zuberi Spanish Civil War Eulogy What can this faded document tell about a US volunteer fighting in another country’s civil war? Related Investigation Florida Map How did this faded map help unlock the riches of the New World?